(Nanowerk News) Breakthroughs in electronics often are the result of finding just the right material for a device -- like the tungsten in light bulbs or the silicon in transistors. Now, a Cornell scientist believes that the mineral kotoite could be an ideal insulator for memory storage devices called magnetic tunnel junctions, found in computers, cell phones and magnetic field sensors. The work, building on previous research by other Cornell scientists, is published by Derek Stewart, the Cornell NanoScale Science and Technology Facility's computational research associate, in the Dec. 17 online edition of Nano Letters. 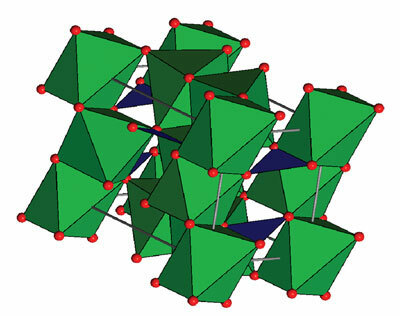 A representation of the mineral kotoite's crystal structure. The oxygen atoms are red, and the magnesium atoms are located at the centers of the green octahedra. The boron atoms are located at the centers of the blue triangles connecting the oxygen atoms. Magnetic tunnel junctions are made of a sandwich of two magnets, typically iron-based, with an oxide in the middle only nanometers thick. (A nanometer is one-billionth of a meter.) Electrons "tunnel" between the two magnets, and the oxide filters information from the electrons' spin states to create what is called nonvolatile memory, which doesn't require electricity to store information. These junctions are also used as very sensitive magnetic sensors or read heads for hard drives, since the device currents depend on the relative orientation of the iron layers' magnetic poles. Cornell researchers, including Robert Buhrman, the John Edson Sweet Professor of Engineering, and Dan Ralph, the Horace White Professor of Physics, have been on the leading edge of this technology for several years. In industry today, most magnetic tunnel junctions use aluminum oxide as the insulator. But in labs across the world, magnesium oxide is being tested as a next-generation insulator, because its cubic crystal structure matches well with the metallic leads, allowing more efficient filtering of electrons. John Read, a former graduate student in Buhrman's lab (now a postdoctoral associate at the National Institute of Standards and Technology), discovered by accident that the element boron, which he had used at Cornell while fabricating magnetic tunnel junctions to help smooth the material interfaces, was leaking into the insulators and forming a crystal, rather than diffusing away as intended. Yet the devices still worked. Curious, the team tapped Stewart's computational expertise to work backward and figure out what specific material may have been inadvertently created between the two magnets as a result of the boron contamination. Density functional calculations brought Stewart to kotoite (Mg3B2O6), a magnesium oxide that also has two boron atoms, which matches well with the magnets' chemistry, allows good electron filtering, and has a slightly different crystal shape than plain magnesium oxide (MgO). He also demonstrated that the mineral's crystal shape -- orthorhombic, as opposed to magnesium oxide's cubic symmetry -- could lead to even better electron spin filtering. "Derek did a beautiful job of demonstrating that the symmetry arguments that one makes for magnesium oxide can be demonstrated for [kotoite]," Read said. Calculations were done on the Intel Cluster at CNF, which is funded by the National Science Foundation.